Wireless lapel microphones are hands-down awesome, but the downside is; they don’t work very well with iPhones. If you have tried it, I’m sure you can relate to the headache it is. I needed to use a lapel microphone for iPhone in my business to record a number of videos and was so frustrated that it wasn’t working well. And then, I found some solutions. I thought I’d share them with anyone who is having the same problem with their iPhone. We have enough problems in our lives without having to fight technology! I’ve made a table of cheap wireless lapel microphones that work well with your iPhone so that you can find something that works for your needs. We recently upgraded to the Sennheiser Wireless System! Learn more about the Sennheiser Wireless System! IMPORTANT! Be sure to scroll to the bottom as well, because there are some additional things you must do in order for your system to work with your iPhone, such as purchasing the right adapter. 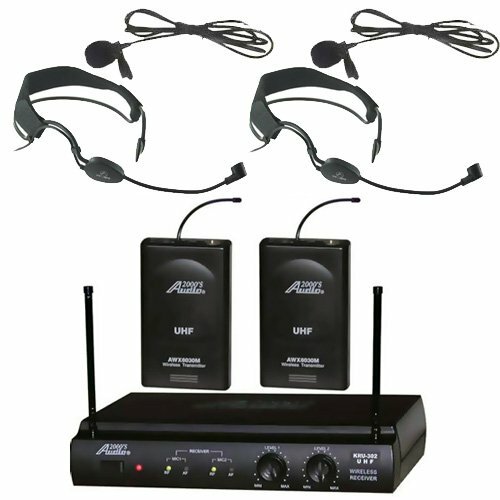 On the high end of the budget wireless lavalier systems, this Audio2000s system includes not one, but TWO, microphone setups and includes a very tunable receiver module that provides exceptional range. It should be noted this is a 12-18v wireless receiver and will require access to power to operate. If this fits your needs then this system wireless lapel microphone setup should work very well with your iPhone, iPad and iPod! Two receivers in this product make it an exceptional value if you plan to need a backup wireless transmitter or plan to do interviews. Reviewers are plentiful and the comments are that this system just plan WORKS! Surely it will be a great addition to your iPhone too. Audio-Technica is a brand for the value conscious consumer. If you are working on a small budget, need a cheap wireless lavalier microphone system for your iPhone, iPad or iPod and expect decent features, the Audio Technica PRO88W-R35 is the perfect system for you. Using a higher band and switchable frequencies enables this system to work with less interference and at greater ranges than the less versatile Pyle-Pro wireless lapel microphone system. If a fair set of features, durable construction and a trusted name in audio are what you’re looking for, look no further, this is a great set for your iPhone. 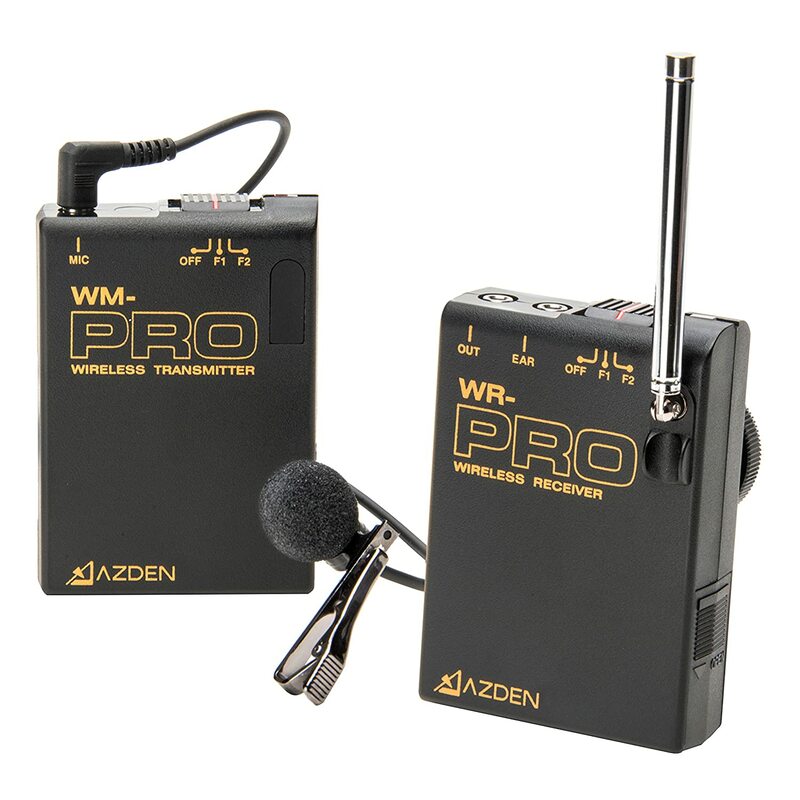 A popular budget wireless lavalier microphone system among videographers and works very well with iPhones as well is this Azden PRO system. 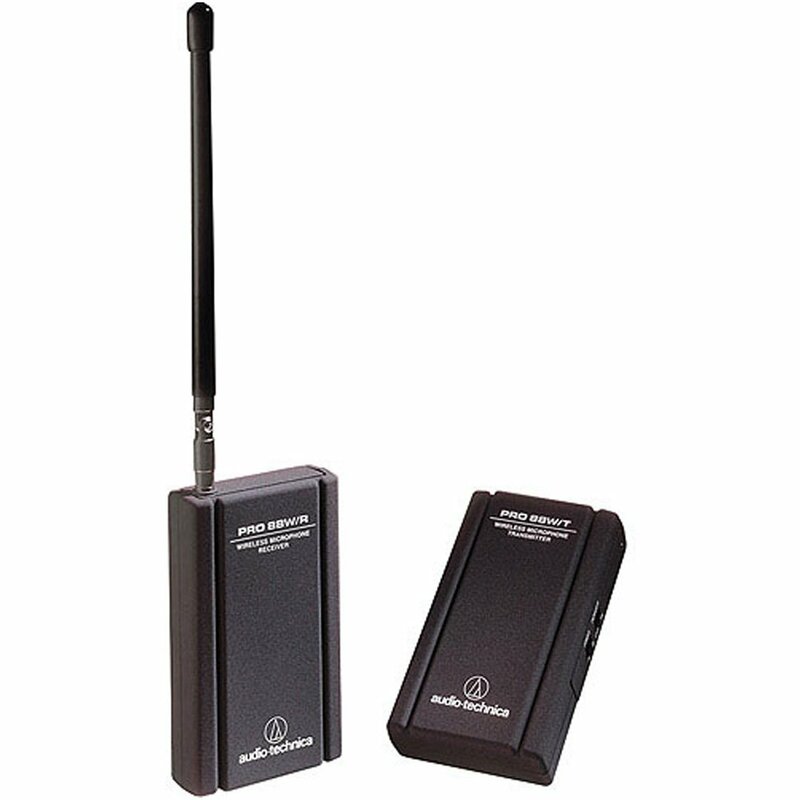 It features 2 different frequencies to reduce potential interference, has exceptional range, long batter life, durable components and works with nearly any 3.5mm wireless lapel microphone including the included model. Reviewers say the best upgrage for this system is a better mic, but the included microphone works very well for a low cost wireless sytem ready to use out of the box. If you’re working on videos and need to get audio without wires give the Azden system a serious look! 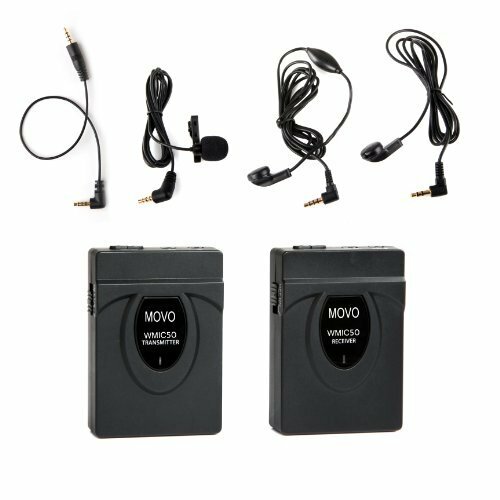 Movo has built a great wireless lavalier system that is very compatible with the iPhone owner on a budget… The Movo WMIC50! This easy use, but feature rich wireless lavalier microphone system is perfect for iPhones and cameras alike. Coming packaged with a camera shoe / tripod mount built into the receiver you’ll not have any problem securing the receiver when recording. Jumping to an ultra high frequency of 2.4GHz and internal boost antennas give super range and strong signals for clear reception. Excellent user reviews and under $100 means it’s a wise choice for your iPhone! Pyle-Pro has been making the finest audio devices for decades. 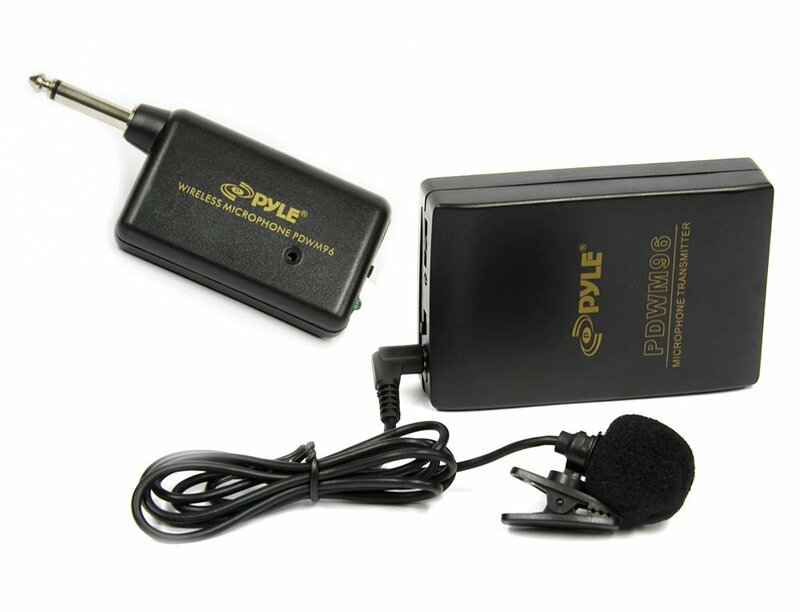 Here again they offer a VERY affordable wireless lapel microphone system that works very well on an iPhone 3, iPhone 4 and 4S, iPhone 5, 5c, 5s and iPhone 6… the Pyle-Pro PDWM96! This wireless system is sure to satisfy anyone working on a tight budget it is by far the most affordable system available. With all the components you need in a single box you’ll be up and running quickly without a bunch of hunting for extra parts. Reviewers say this cheap, but functional, lapel microphone works well with iPhone and most cameras and recorders. Important! You will need to convert this receiver to a standard 3.5mm jack. Important! In nearly every case, you’ll need a special adapter to make these work with your iPhone. In nearly EVERY CASE you will need a special adapter to make your wireless lapel microphone system operable with your iPhone. iPhones use a unique recessed headphone jack that isn’t directly compatible with most 3.5mm cables. The design Apple uses for their headphone jack is proprietary, but there are cables which will make it all work very well. We have found the following adapters to be excellent. IMPORTANT: There are two different versions below. You’ll want to choose the correct one for your system. One works with SELF POWERED MICS and the other works with BATTERY POWERED MICS. You’ll need to know which microphone you plan to use and purchase accordingly. WARNING: Going cheap can be bad here. After you’ve spent so much on getting your system up and running you can have junk components make the whole system Fail. We have tried the Cellet Slim 3.5mm Pin to 3.5mm Input Mini-Jack Adapter for iPhone – White because it was cheap and appeared to work, but the nearly 50% bad reviews don’t lie. The adapter does work on normal microphone inputs, but does not appear to work on the iPhone as promised. If you want to risk it, go ahead. Instead here is a proven alternative. A self-powered mic gets its power from the device, not an inline battery. A battery-powered mic gets its powers from an inline battery source. Here’s a helpful video to explain adapters. I hope this helps some poor struggling soul out there! If you have a different solution feel free to share in the comments! Pyle-Pro PDWM96 Lavalier Wireless Microphone System with the Grado Mini Adaptor Cable – 1/4 Inch to 1/8 Inch Plug on my iphone 5 and ipad with neither device picks up the external mic but uses the internal mic which is unacceptable. Am I doing something wrong or is this the wrong combination? The Grado adapter doesn’t seem to be reliable. Sometimes they work. Sometimes they don’this. Without that kv connection adapter I never could get my mic to work. Make sure you read it carefully as there are two kinds. One for powered mics (the Pyle pro is powered) and one for non-powered mics. But the Pyle-Pro has a 1/4″ receiver plug and the KV adapter cable has a 1/8″ receiver. So I got a Radio Shack 1/4 to 1/8 adapter but so far no luck. because it has the option to enable an audio meter on the recording screen. When I noticed I wasn’t getting an audio signal, I disabled the audio to my hearing aids and that did the trick. So I think I’m good to go for now. You’re correct in grabbing a 1/4″ to 1/8″ adaptor. Sounds like you might have the wrong KV Connection adaptor? There are two different kinds. I use the “powered mic” model and my Pyle Pro works great. Do you know which model of KV Connection adaptor you ended up with? I have the Azden WHD-ProAudio kit. Do you know if this is compatible to work with the iPhone if I were to get the adapter you recommend? Hey Jeff! Yep you should be good to go. Be sure to research whether you’re system has a self powered mic or not. Then hit up kvconnection.com for the appropriate connector. Still using my today and it’s working great. Good luck! My advice is to buy BOTH KV Connection adaptors listed above. They’re great tools to have and they’re affordable at under $30 each. If you’re going to spend $100 or more on a mic system it’s best to have good adaptors for the different mics you’ll need to use. External microphones are better than internal microphones because you can choose the right microphone for the situation, you can control the microphones placement and distance, they tend to have a greater sound quality, and they help eliminate unwanted noises. Glad to have found this review, but I’m still a bit confused. The Audio Technica has questions like “will this work with my iphone?” and all of the answers are “no” answers. So sorry for the slow reply. We moved our blog over to new hosting and unwittingly were not receiving comment notices. Yes most all Lapel Mic and Wireless Mics don’t work OUT OF THE BOX with the iPhone which was the insanely difficult struggle that lead me to writing this article. So the answer is yes it will work. You’ll need to make sure you have the KV Connection adaptor listed above. This is the most crucial part of making your mic system with with iPhone as Apple uses this silly custom plug style. If in doubt, just buy both adaptors. They’re affordable especially if you’re going to use a nice wireless mic system. I own both because we switch up mics a lot depending on what we’re doing so sometimes I have have a powered mic in use and other times when I need it to be more discrete I used a self powered mic. Which adaptor should I purchase for the Pyle-Pro PDWM96 Lavalier Wireless Microphone to connect it to my iPhone 6? Hey Robert, you’ll need a “Non powered mic” adapter! Cheers! I bought the Pyle-Pro PDWM96 Lavalier Wireless Microphone System and the KM-iPhone-Mic adaptor made exactly as you specified (for the powered mic). It doesn’t work. The other adapter (which I did not buy) is for a non-powered mic. What gives with this? Darryl my apologies for the confusion. The fastest solution at this point would be to grab a powered mic since you already have the Pyle Pro system and the Powered Mic adapter. I’ll review the article to remove any confusion about which adapter to purchase. For the Pyle Pro you’ll need a “Non powered mic adapter”. i had the same problem as Darryl. I purchased the Pyle-Pro PDWM96 Lavalier Wireless Microphone System but am confused exactly which adapter I need to plug it into my device. Can you clarify this please? With this you’d want the “self powered” mic adapter. The Pyle Pro does not have a battery pack on the mic. That’s how you’d know it’s a self powered mic. Hope that helps! Hi i have purchased a SONY WSC-999 wireless microphone system. I’m just wondering if this adapter will help with it connecting to my iphone which i use regular to do videos? Yep! It’s very important because of how the iPhone headphone plug works. Guess what though. now with iPhone 7 not having a headphone jack…. we’re all screwed! RIGHT?!?! COME ON APPLE! Hello eat success; The links you have below for the self-powered and the battery powered are the same. Please send me the link for each of these. Thank you. 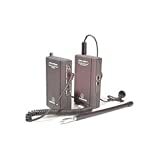 Question; will these work with the Mic you recommended: Pyle-Pro PDWM96 Lavalier Wireless Microphone System ? Thank you very much for helping me. Hey shank you very much for the info. Still have a question – which adapter should I buy when using the Sony UWP D11 microphone with the Iphone? Thanks a lot! Will these microphones work with iPhone 6s? Thank you. Sorry Brian! Weird, we have not been getting notifications for this page. The answer is Yes! They will work with the proper adapter as mentioned above. Is anyone bothering to even read and respond here?